Most techniques employed for evaluation of the electromagnetic parameters of metamaterials are based upon the transmission, reflection and refraction measurements. The type of the structure analysed determines the specific experimental arrangements. The instruments used for optical measurements involve spectrometers and ellipsometers, whereas the initial material identification requires the structural analysis and microscopy. The main types of spectrometers, ellipsometers and interferometers are briefly outlined accompanied by the description of their operational principles. Application of these apparatus to the experimental characterisation of the specific types of metamaterials is outlined. The main approaches to the experimental characterization of metamaterials at optical wavelengths and in THz ranges are summarised here. The measurement techniques and the parameters’ retrieval procedures are primarily determined by two factors - the type of material under examination and the parameters required for description of its properties. Before starting the experimental measurements of a particular specimen, it is necessary first to clearly specify what kind of electromagnetic properties are examined. According to the “roadmap” guide for the material characterisation one should initially identify if a particular composite can be described by a few material parameters or it exhibits the so-called mesoscopic behaviour, i.e. its response changes from sample to sample, depending on the sample size, shape, and environment. In the latter case, the sample cannot be described in terms of the conventional macroscopic (averaged) material parameters employed in the constitutive relations of Maxwell’s equations, and their internal structure and microscopic properties should be taken into account for each sample individually. Alternatively, if the specimen is qualified as a continuous medium, it can be described by the extrinsic effective material parameters, like permittivity and permeability tensors (sometimes including an electromagnetic coupling tensor), which can be retrieved from the sample response to electromagnetic wave stimuli. The detailed overview of the material types and respective parameter systems used for their characterisation is provided in this paper. For more details see, also,Â here. An initial step in characterisation of a NSM specimen is identification of its type, i.e. whether it is a continuous medium or mesoscopic structure. The main notion of complex mesoscopic structures is that they do not display the same uniformity of the scattering pattern as homogeneous materials . Therefore the sample type can be reasonably identified with the aid of the following two analyses: diffuse scattering or/and transmission electron microscopy (TEM). While TEM provides the high resolution electron diffraction patterns for detailed observation of multilayered samples , it has a drawback - the specimen is irreversibly damaged in the course of examination. The latter issue is likely to overweigh the benefits of the high spatial resolution of only a few Angstroms and sensitivity to very weak scattering effects . On the other hand, the structural TEM analysis of NSM is imperative, and the provisions for sacrificial samples should be made to enable the destructive tests for the sample initial identification. The non-destructive alternative is to measure the sample diffuse scattering at an appropriate wavelength. Depending on the apparatus used, incident waves scattered by the specimen can be recorded to give either 2D or 3D image outputs. A schematic diagram of a diffractometer used for these measurements is shown in Fig. 1. For 2D measurement, linear position sensitive detector (PSD) diffractometers are used to register the scattered light over a range of diffraction angles. The PSDs are arranged in an arc above the sample so that the scattered rays are incident normal to the detector window at all angles within the diffractometer range. In this configuration, most of the scattered radiation is going not detected, and so valuable data that would be used to image a scattering pattern is lost. 3D outputs on the other hand can be obtained using flat image plate (IP) detector systems that use higher energies of the incident waveforms. An increase in energy results in better resolution for absorptive samples and smaller angles of diffraction, meaning the detection process is easier and can be more extensive . In both PSD and IP configurations, a monochromator and a collimator are affixed to the output of the beam generator, ensuring the incident waves are all normal to the sample and of a desired frequency. The collimator is generally positioned approximately two millimetres from the surface of the specimen and a beamstop, used to restrict the perpetual travel of the waveform, is placed about eight millimetres behind the sample . Because the collimator and beamstop are placed so close to each other, air scattering is virtually eliminated. During the measurement process, the sample is scanned while it gradually rotates; for example 1000 scans at rotational increments of 0.36 degrees. If the detectors were rotated instead, there would be a likelihood of unwanted vibrations distorting the measurement data. Figure 1. A schematic diagram of a diffractometer showing divergence at each stage of the measurement process . An alternative to IP systems is the charge coupled device (CCD) detection (see here). Following the successful sample identification and qualification as continuous medium, the measurements of the broadband plane-wave transmittance and reflectance are performed at the next stage. There are numerous ways to obtain the reflection (R) and transmission (T) coefficients of a sample, which utilize different types of equipment. Spectroscopy and ellipsometry are the techniques most frequently used for these measurements. The typical commercial apparatus used for spectroscopy is a spectrophotometer which, as its name suggests, is an amalgamation of a spectrometer and photometer. The spectrometer part of the system emits light of a selected wavelength that is incident at a given angle on the sample under examination while the resultant radiant flux is measured by a photometer. Spectrophotometers commonly use two incident beams during R and T measurements: one is a probe and the other - a reference. They also allow the angle of incidence to be adjusted to suit the requirements. However, whilst these instruments are specifically designed for R and T measurements, often they are not directly applicable to the characterisation of metamaterials and nanostructures at optical frequencies. This is because spectrophotometers require a relatively large sample area, whereas NSMs fabricated by using electron-beam lithography and other such protracted techniques typically occupy an area no larger than a few square millimetres . Nevertheless the spectrophotometers can be adapted for R and T measurements on the NSMs using a “custom built” apparatus as shown in Fig. 2. Figure 2. Experimental custom-built system for the measurements of broadband transmission and reflection spectra of small samples . This system images the sample, through use of optical magnification, onto a spectrograph with polarised light. A reliable polariser such as a Glan-Taylor prism could be positioned in front of the light source to produce the light with the desired linear polarisation . This is particularly important in the case of metamaterials, most of which are anisotropic. Therefore thorough control of the light polarisation is the essential prerequisite for reliable measurements of the sample. The incident light itself should be generated by a broadband source, for example a tungsten-halogen lamp. Beamsplitters, iris diaphragms, and multiple lenses and mirrors are required in a custom built arrangement to restrict and control the light travel direction. In order to analyse the spectrum produced by the lamp, a monochromator is placed between the polariser and the sample. Another monochromator placed in the path of the reflected light (i.e. between the sample and the detector) provides selectivity of the reflectance spectra. The reference reflectance measurements are calibrated first using a clean, unblemished mirror while transmission references are obtained by using either free space or a pattern-free area of the sample substrate, depending on whether all layers or just the nanostructured patterns are to be analysed . Fourier transform infrared (FTIR) spectroscopy can used to obtain both the R and T coefficients even though this technique does not involve the direct measurements of reflectance and transmittance. 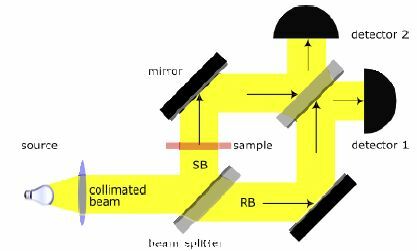 FTIR, and other types of interferometric spectroscopy, operate by splitting the incident beam using a partially reflective material . The system, often configured in the Michelson arrangement, creates interference between the original beam and the one subjected to a longitudinal delay before being directed to the detector . Unlike systems with a monochromator, FTIR measures waves at all generated frequencies simultaneously. This eliminates the need of multiple measurements and thus speeds up the process considerably. Additionally, because of the greater optical throughput, FTIR spectra also display a more favourable signal-to-noise (SNR) ratio than many dispersive spectrometers . The obtained interferogram contains data from all wavelengths produced by the infrared light source with respect to time. This is known as a time-domain measurement, as the R and T spectra are not directly measurable. Fourier transformation is then applied to the output interferogram to recover the frequency spectrum. Also phase information can often be determined here that represents further advantage of the interferometric spectroscopy over the dispersive methods . Similarly Time Domain Spectroscopy (TSD) in which the phase angle is obtained from interference measurements performed in custom built systems. A simplified schematic of a TDS setup is shown below in Fig. 3. The illuminating EM radiation is generated by the femtosecond pulses from a Ti Sapphire laser incident on either a crystal converter or optoelectronic converter to produce, for example, THz radiation. The optical delay line alters the phase of the beam arriving at the sample. A detailed description of the TDS system for THz range is given in reference . Mach-Zehnder interferometer shown in Fig. 4 can be used as an alternative to the Michelson arrangement in the interferometric spectroscopy instruments. It is used to determine the relative phase shift between the two beams travelling along different paths. Unlike Michelson system, Mach-Zehnder interferometers utilize two beam splitters to ensure that the split beams are not recombined and are measured using separate detectors. Because both beams are detected individually and neither one is reflected back into the source, as is the case in the Michelson configuration, spurious interference caused by intensity and phase modulation is prevented . Furthermore, because both beams of light travel parallel to each other rather than orthogonally, the Mach-Zehnder system is more resilient to ambient disturbances than the Michelson interferometer . Before measurements can be successfully taken, the variable phase shifters and attenuators in Mach-Zehnder interferometer must be properly calibrated. This can be achieved by varying the optical path length and subjecting the light to total internal reflection within two prisms for attenuation purposes . As illustrated in Fig. 4, in absence of a sample both beams arriving to detector 1 have been reflected twice (once by a beam splitter and once by a mirror) and have passed through the glass body of a beam splitter. Because there is no phase difference between the two beams in this instance, they constructively interfere at detector 1. Conversely, total destructive interference occurs at detector 2 as the beams are offset for half a wavelength from each other. This is due to the difference in the optical path lengths and results in the light cancellation at detector 2. Therefore placement of a sample in the path of one beam changes its intensity and phase. Comparison of the data from both detectors gives the phase shift incurred by the sample. Adapted Mach-Zehnder interferometers are also used to measure directly the refractive index of dielectric samples . Irrespectively of the interferometer used, the acquired data need post-processing including Fourier transforms of the produced interferogram to recover the resultant frequency spectrum which can be subsequently used for the material parameters’ retrieval. In order to determine the minimal set of measured data, required for retrieval of the constitutive parameters, the effect of measured sample on the polarisation characteristics of the reflected and transmitted light must be examined next. These measurements enable identification of the type of material under test, for example, whether it is isotropic, anisotropic, bi-anisotropic, chiral or gyrotropic. Ellipsometry provides the primary means for accomplishing this task through non-destructive and contactless measurements. Ellipsometry  allows the measurements of the change in the polarisation state of light after reflection from the specimen. The ellipsometry data is commonly required to retrieve the tensor parameters of anisotropic materials and assess the effect of the elemental physical properties such as morphology, crystal quality, chemical composition and electrical conductivity  and film thickness in layered structures . Typical ellipsometer comprises a light source, polariser, compensator, analyser and a detector shown schematically in Fig. 5. Figure 5. Schematic diagram of an ellipsometer . There are two main categories of ellipsometers: rotating optical element systems and instruments with photoelastic modulators . Systems with rotating elements have either a rotating analyser (rotating analyser ellipsometry, RAE) or a rotating compensator (rotating compensator ellipsometry, RCE), although other setups do exist . Irrespective of the type of ellipsometer system used, it can be configured so that the reference wavelength, illumination angle and sample orientation be all varied. Antiquated systems use a monochromator to select the desired wavelength of incident light and a photomultiplier tube for detection . However more efficient setups employ a white light source for the incident wave and a photodiode array as a detector, allowing simultaneous measurement of a broadband spectrum and a real-time display of the results . The light, which is initially non-polarised, is transmitted through a polariser oriented between the p- and s- planes. It is then targeted onto the sample surface so that the linearly polarised light is reflected and becomes elliptically polarised before passing through an analyser which, depending on the system configuration, may or may not be rotating. The photodetector then converts the received light into an electric signal which is post-processed, comparing the reference and reflected waveforms. The resultant complex polarization ratio, ρ, is then determined from the measured values of amplitude ratio Ψ and phase shift Δ. Since the polarization properties are determined not only by the angle of incidence but also by wavelength, it is desirable to take measurements of the same sample at various incidence angles and different wavelengths. The modern ellipsometers that combine this double control (angle of incidence and wavelength) are called Variable Angle Spectroscopic Ellipsometers (VASE) . VASE techniques consist in capturing ellipsometry data on a wide range of wavelengths and for a discrete set of angles of incidence. The ellipsometer consists on two arms (illuminating and detection) that are aligned with the same but variable angle with respect to the flat sample. The illuminating arm contains a 50W quartz tungsten halogen (QTH) lamp, optics for beam collimation and a polarizer with fixed orientation at 45 degrees with respect to the s and p components. Light reflected from the sample is then analyzed at the detection arm. It is a RCE type instrument with the detection arm containing a rotating waveplate and analyzer, in order to achieve a full determination of the reflected beam polarization ellipse. In addition the detection arm includes a spectroscopic system that permits measurements at 390 different wavelengths in the range from 370 to 1000 nm depending on the ellipsometer model. When selecting an ellipsometer setup, the merits and shortcomings of the specific configurations should be assessed from the standpoint its specific use. Namely, both Rotating Polariser Ellipsometers (RPE) and RAEs are very accurate and easy to assemble but their measurements of phase shift are less sensitive and accurate at 0 defrees and 180 degrees. RPE systems are likely to suffer from residual polarisation from the incident source wave . In both systems the rotating element needs calibration for the highest accuracy measurements to be achieved. RCE ellipsometers have the advantage of using two static polarisers that eliminate the effect of residual polarisation and can measure Ψ and Δ without suffering from reduced sensitivity at certain angles. Also worth consideration is the inclusion of a monochromator. As monochromators produce partially polarised light they are often placed after the sample, meaning a wide spectrum of white light is incident on the specimen . This is of course important if the sample is in any way photosensitive. In the case of general anisotropic thin layered films, as many as ten parameters need to be retrieved for each layer – nine for the dielectric tensor and one for film thickness . The respective measurements must be taken over a wide range of incidence and azimuthal angles to ensure an adequate set of acquired data. Each individual dielectric tensor and thickness parameter should noticeably alter the detected polarisation data and not give a linear output of collated results . By utilising a Mueller matrix, the dielectric tensor parameters are then retrieved by post-processing raw data of the ellipsometric measurements. It is necessary to note here that commercially available ellipsometers contain built-in software for retrieval of optical constants of thin-film samples. Extreme caution should be exercised when evaluating new materials, because the built-in post-processing software employed for analyzing (or, more precisely, interpreting) angle resolved reflectance polarisation data is limited to the idealised models of natural dielectrics and layered structures only. But these models are usually inapplicable to the materials with magnetic responses (or negative refractive indices). Also, analysis of the low symmetry metamaterial samples may be problematic too. The raw data acquired in the spectroscopic and ellipsometric measurements are subject to further post-processing. However, it is important to emphasise that anything beyond the specific measured quantities, e.g., retrieval of whatever effective optical parameters (refractive index, impedance, dielectric permittivity, magnetic permeability, bi-anisotropy parameter, etc. ), is not a subject of the experimental optical characterization procedure itself but a subject of interpretation (!) of the acquired experimental data. This distinctive step which is interlinked with the parameter retrieval procedures based upon the theoretical models or numerical simulations has been comprehensively addressed in our paper. Several different methodologies based upon spectroscopic and ellipsometric measurements can be used for the experimental characterisation of nanostructured metamaterials in optical range. The requirements to the set of experimental data vary depending on the type of the material systems to be analysed. The recommended measurement procedures for a few types of materials are presented in this section. For the metamaterial structures with inversion symmetry the reflectance and transmittance spectra do not depend on which side of the sample is illuminated by the normally incident wave. A common procedure is to measure transmittance intensity and/or reflectance spectra of a metamaterial slab of thickness L at normal incidence of light of two orthogonal linear polarisations of circular polarisation. Clearly, these data containing two quantities at each wavelength are insufficient to retrieve uniquely the optical parameters, e.g., the complex refractive index and the complex impedance of the equivalent isotopic slab at each wavelength. Thus, usually, the experimental data of optical spectroscopy are compared with the theoretical simulations for the designed specimen using additional information on the geometrical parameters which are obtained from optical and/or electron micrographs of the metamaterial samples. The situation becomes more complex if the metamaterial structure has no centre of inversion along the propagation direction of light. Still restricting the measurements to normal incidence of light onto the metamaterial slab, the complex transmittance and reflectance spectra are no longer the same for the two opposite directions of incidence. In other words, generally eight different quantities have to be measured at each wavelength – provided that the polarization state of the incident light is conserved in both reflectance and transmittance. Otherwise, the number of independent optical parameters doubles. In case of reciprocal structures (i.e., no static magnetic bias applied and no natural magnetic phase), the complex transmittances are strictly identical for both directions of propagation, whereas the respective complex reflectances may differ. This amounts to six quantities to be measured at each wavelength. Again, in the published experiments, not the full fields but only the corresponding intensities have been measured. As a result, the problem of the effective parameters’ retrieval is underdetermined. As discussed in deliverable D2.1.6, additional theoretical input is required for extracting the effective optical parameters. Experimentally, this has been done in the literature only once so far in . Needless to say that the meaning of the retrieved quantities is subject of the same constraints as before, i.e., caution has to be exercised in interpreting these effective parameters as the “material” parameters. They do, however, have a well defined physical meaning for the measured film of thickness L.
Chiral structures constitute a subclass of bi-anisotropic materials which rotate linear polarised light. Notably the reflectance and absorbance in chiral materials do not depend on which side of the sample is illuminated by normally incident light. Provided that phase information is acquired, the measurements can be performed equivalently either with linear or with circular polarization of the incident light. If no phase information is obtained (i.e., only intensity measurements), the transmittance and reflectance data have to be acquired for two different linear polarizations as three complex parameters (dielectric permittivity, magnetic permeability, and chirality parameter) need to be retrieved. A minimum requirement for a meaningful parameter retrieval is that one checks that the two incident circular polarizations of light stay circular (with the same handedness) upon transmission. Additionally, from the generalized Fresnel coefficients it follows that left-handed circular polarization has to turn into right-handed circular polarization and vice versa in reflection. In other words, circular polarization cross-conversion needs to be small. This is equivalent to stating that the structures must not exhibit additional linear birefringence. The effective refractive index, n, and effective permittivity and permeability are frequently employed to describe the metamaterials made of stacked layers of periodic inclusions. However, one should be aware that these quantities are not the fundamental physical parameters but the derived characteristics. Therefore inferring these optical parameters (e.g., permittivity or permeability) from the spectroscopic and ellipsometric measurements again requires making use of the dedicated theoretical models of the measured specimens. An alternative type of the refraction measurements is based upon the use of prism made of wedge-shaped metamaterial sample (rather than the slabs discussed so far). The light wave transmitted through such samples is generally deflected due to refraction. Measuring the corresponding light deflection angles allows the equivalent refractive index to be deduced using Snell’s law. However, such obtained effective refractive index generally differs from the refractive index n normally associated with the slow-wave factor of phase velocity, c=c0/n in material. In the published experiments such retrieved effective refractive index qualitatively predicted the light deflection by the prism but the exhibited significant error in attenuation and figure of merit estimations. Contact the laboratories where you potentially can get help for characterization of nanostructured materials. van Rossum, Nieuwenhuizen, Multiple scattering of classical waves: microscopy, mesoscopy, and diffusion, Rev. Mod. Phys. 71, 313, 1999. Welberry, Diffuse X-ray scattering and models of disorder, International Union of Crysallography, Oxford University Press, 2004. Shmueli, International tables for crystallography, Volume 2, Third edition, Springer, 2008. Cai, Shalev, Optical Metamaterials: Fundamentals & Applications, 1st Edition, Springer, New York, 2010. Cai et al, Metamagnetics with rainbow colors, Optics Express, Vol. 15 No. 6, 3333, 2007. Brady, Optical imaging and spectroscopy, John Wiley & Sons and The Optical Society of America, 2009. Thorne, Litzen, Johansson, Spectrophysics: Principles and Applications, Springer, 1999. M. Hofmann, Novel Techniques in THz-Time-Domain-Spectroscopy (Chapter 3) in A comprehensive study of technical improvements to THz-TDS Inaugural-Dissertation Fakultat fur Mathematik und Physik der Albert-Ludwigs-Universitat Freiburg im Breisgau vorgelegt von Stefan Gorenflo aus Hausen im Wiesental im November 2006. Schubert, Kuck, Gottfried-Gottfried, Refractive-index measurements using an integrated Mach-Zehnder interferometer, Sensors and Actuators A: Physical, Vol. 60, 108-112, 1997. Fujiwara, Spectroscopic Ellipsometry: Principles and applications, John Wiley & Sons, 2007. Nanostructured Metamaterials, Exchange between experts in electromagnetics and materials science, Edited: Anne F de Bass, Luxembourg, European Union, 2010, ISBN 978-92-79-07563-6. G. E. Jellison, Generalized ellipsometry for material characterization, Thin Solid Films 450 (2004) 42. J. A. Woollam, B. Johs, C. Herzinger, J. Hilfiker, R. Synowicki, and C. Bungay, Overview of Variable Angle Spectroscopic Ellipsometry (VASE), Part I: Basic Theory and Typical Applications, SPIE Proceedings, CR72, (1999) 3-28. Collins, Automatic rotating element ellipsometers: Calibration, operation and real-time applications, Rev. Sci. Instrum. 61, 2029, 1990. An, Li, Nguyen, Collins, Spectroscopic ellipsometery on the millisecond time scale for real-time investigations of thin-film and surface phenomena, Rev. Sci. Instrum. 63, 3842, 1992. Bass, Handbook of Optics, MacGraw-Hill, USA, 2010. M.S. Rill, C. Plet, M. Thiel, I. Staude, G. von Freymann, S. Linden, and M. Wegener, Nature Mater. 7, 543 (2008).